The international partnership will promote faculty exchanges, joint classes, research and other activities. 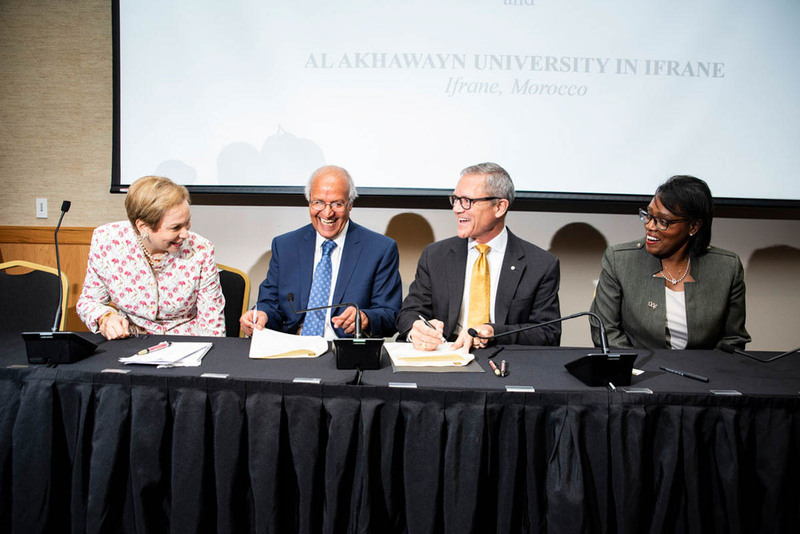 UCF and Al Akhawayn University in Morocco signed a memorandum of understanding Thursday creating an international partnership to promote faculty exchanges, joint classes, research and other activities. The agreement was signed by UCF President Dale Whittaker and AUI President Driss Ouaouicha at the FAIRWINDS Alumni Center before a contingent of visiting dignitaries from Morocco, including Princess Lalla Joumala Alaoul, who is Morocco’s ambassador to the United States, and 15 traveling Moroccan journalists covering the story. “AUI and UCF have much to gain by working together.” – UCF Provost Elizabeth Dooley. “AUI and UCF have much to gain by working together, particularly by offering our students and faculty an amazing opportunity to build sustainable relationships,” said UCF Provost Elizabeth Dooley. The agreement has been in the works about a year since UCF co-sponsored a conference in Casablanca, Morocco, on water, energy and food security. Afterward, the UCF contingent visited the AUI campus in the town of Ifrane. That visit to Morocco was followed up by another joint conference at UCF sponsored by the two institutions. Thursday’s memorandum identified several areas of cooperation, particularly in political science and other social sciences, said David T. Dumke, director of UCF’s Middle East and South Asia Initiatives and the Prince Mohammad bin Fahd Program for Strategic Research & Studies. The university was founded in 1995 by King Hassan II of Morocco with support from King Fahd of Saudi Arabia. It was developed on the model of higher education in the United States, and all the classes are taught in English. Enrollment at the university is about 2,200. Dumke said AUI has an impressive, safe campus and a great Arabic language program — making it a good destination for study-abroad programs. “AUI’s faculty, many of whom are American or American educated, are also eager to work with international partners,” he said. Peter Jacques, a UCF political science professor, will present a lecture at AUI next month. He is working on a food-security research project in Morocco. The princess said the signing of the agreement bears witness to a growing trend of more opportunities between the two countries and for the students at both institutions. “I have no doubt they will play a leading role as bridge builders between our two countries,” she said. The American University in Cairo recently hosted events at their New Cairo campus featuring UCF’s Hakan Ozoglu, Ph.D. and David Dumke. Dr. Ozoglu, a professor in the Department of History and Chairman of the Middle East Studies Program, spoke about the transition from the Ottoman Empire to Turkish Republic. Dumke, Director of the Prince Mohammad Bin Fahd Program for Strategic Research and Studies (PMBF) and Middle East Initiatives, discussed the American political landscape and how the November midterm elections could change U.S. foreign policy. The Cairo talks also marked the start of a new faculty exchange initiative between the PMBF Program and AUC’s Prince Alwalid Bin Talal Bin Abdulaziz Alsaud Center for American Studies (CASAR). “We want to thank AUC for arranging our visit. Dr. Ozoglu and I were impressed by the interest of the AUC community on topics both historic and current. And, as is the often the case, we learned a great deal from the questions we were asked. We are also pleased that our visit will help open the doors for others at UCF to listen, learn, and talk about the issues that draw our nations together,” said Dumke. Jonathan and Nancy Wolf, who believe the partnership between these two prestigious universities will help foster greater understanding of the broader U.S.-Egyptian relationship. In addition to the student exchange component, the Wolfs also support other areas of cooperation, including faculty visits, exchanges, and development programs. The PMBF-CASAR initiative will see UCF experts like Ozoglu and Dumke visit Cairo to talk to students, faculty, and others about policy, politics, history, and other topics of interest. AUC, in turn, will send its experts to Orlando, where they will give public and private lectures and participate in other events. Plans are also being discussed to identify and support cooperative research projects and co-sponsor special topical events. The initiative is especially keen to focus on critical, yet often overlooked issues such as sustainability in the Middle East-North African region and how millennial opinion will shape U.S.-Arab relations in the future. “We are very excited to work with AUC, one of the premier institutions of higher learning in the Arab world. AUC has a long, well-established reputation in international policy and politics. It provides our faculty a great venue from which to discuss scholastic work and current events; a location highly conducive to specialized research; and, an opportunity to work with outstanding faculty partners. UCF will also greatly benefit by hosting AUC faculty who are recognized as some of the best in their respective fields,” said Dumke. The CASAR Program is part of AUC’s School of Global Affairs and Public Policy. Prior to joining AUC, Haggag held a number of high-ranking diplomatic posts, including two in Washington. CASAR’s Director, Ambassador Karim Haggag, is expected to visit UCF in November 2018. During his trip to Orlando, Haggag will discuss Egyptian foreign policy, U.S.-Egyptian relations, and other contemporary issues in the Middle East. Hakan Özoğlu’s previous research focuses on Kurdish Nationalism in the Ottoman Empire. His book was titled Kurdish Notables and the Ottoman State. The Turkish edition of the book came out in 2004. Özoğlu’s main aim in this project was to understand the process of identity formation and emergence of nationalism. His research interests include the power struggle in modern Turkish Republic after WWI and US involvement of the Middle East through Turkey after the Great War. His latest book deals with the tension between the secularists and the Islamists and with the Kemalist project to tame the political opposition in an attempt to westernize the remnant of the last “Islamic Empire.” His book From Caliphate to Secular State is released by Praeger Press in 2011. He is currently the Director of Middle Eastern Studies Minor. 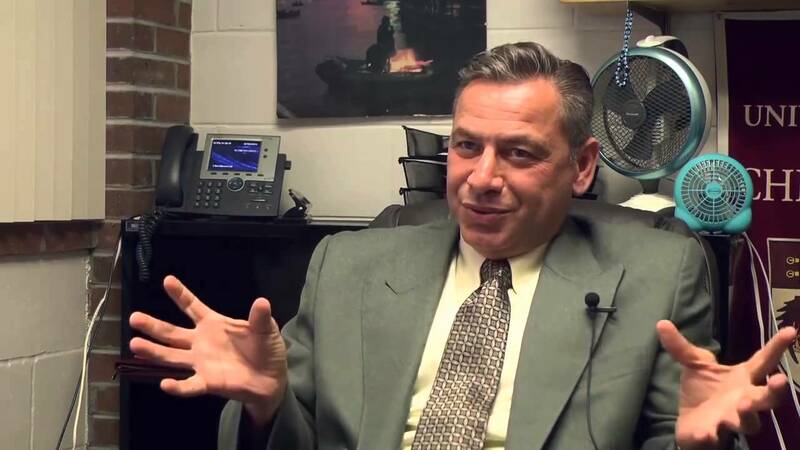 Currently he is working on a book manuscript on “Admiral Mark Lambert Bristol’s Tenure in Turkey.” His interviews and essays have appeared in many international media outlets including, New York Times, Orlando Sentinel, Chicago Tribune, WTTW PBS Chicago . He is the recipient of 2017-18 Fulbright Core Fellowship. After spending the past year conducting research in Turkey, he is back in Orlando, and will provide updates on Turkey’s political landscape, including the increased tension between Ankara and Washington. The Prince Mohammad Bin Fahd Program for Strategic Research & Studies continues to work through a busy summer schedule, highlighted by a presentation to the Parliament of the United Kingdom by PMBF Director David Dumke. Dumke was a guest of the Right Honorable Lord Ahmed of Rotherham. He spoke to the House of Lords on July 9 about diplomacy and protocol in the Islamic world. “It was an honor to speak to such an august audience at such a distinguished setting. It is always important to discuss key issues, and understanding how others see and interact with the world is important to decision-makers in the West, be they in London, Washington, Tallahassee or elsewhere,” noted Dumke. Dumke spoke at a special symposium organized and moderated by Lord Ahmed, and was joined by several other notable experts. The symposium, “Diplomacy and Protocol in Islam,” was timed around the publication of a book with a similar title written by Saudi Prince Faisal bin Mishal bin Saud Al Saud. The Prince has written a series of books about Islam and Saudi governance. He currently is governor of Al Qassim Region. Prince Faisal has long been supportive of UCF’s efforts to build relations in Saudi Arabia. Lord Ahmed, who in 1998 became the first Muslim appointed to the House of Lords, has worked continuously to promote understanding of Islam and build bridges between the West and Islamic worlds. This includes numerous undertakings in the United States to support programs like UCF’s PMBF Program. “We are appreciative of Lord Ahmed for providing us a platform to not only discuss and debate important concepts, but to promote UCF’s efforts to increase knowledge and awareness. We look forward to future events and would welcome working with Parliament in the future,” added Dumke. The London event was cosponsored by NAAM Association, a non-government organization devoted to cultural dialog which is headed largely by Saudi civic and business leaders. NAAM often partners with other non-government organizations to accomplish dialog and social development goals. In addition to the House of Lords, PMBF participated in a series of international events on Middle East-related issues this summer. This included three events in Washington, DC, and a conference in Madrid, Spain. Topics ranged from water and food security issues to U.S. relations with Egypt and Saudi Arabia. For additional information about the PMBF Program, please contact Kinda Haddad at kinda.haddad@ucf.edu, or by calling (407) 823-2510. “The Impact of Social and Economic Reforms on Saudi Youth” Conference will focus on younger Saudis, recent reforms, and opportunities for American collaboration. The University of Central Florida and Prince Mohammad Bin Fahd University will host “The Impact of Social and Economic Reforms on Saudi Youth” January 17-18, 2019, in Orlando. The conference will be held at the UCF Student Union, Pegasus Ballroom, and is being organized by the UCF Prince Mohammad Bin Fahd Program for Strategic Research and Studies. The conference will focus on the Saudi Vision 2030 plan, which calls for the Kingdom to decrease its dependence on oil, diversify its economy, and increase employment opportunities for Saudi citizens – particularly the youth which comprise a high percentage of the population. It is hoped the 2030 reforms will further develop public service sectors such as health, education, recreation, tourism, and infrastructure. Reforms are also creating new areas in which U.S. and Saudi businesses, universities, institutions, and individuals can cooperate. The conference will permit educators, practitioners, students, and members of the business community to participate in an innovative and interdisciplinary discussion focusing on the impact of reforms, particularly on the sizable youth population. “The conference will provide a unique and timely platform to discuss the changes that are underway in the Kingdom, and crucially their transformative impact on Saudi youth. This is the key demographic bloc in the Kingdom. There are also enormous business, educational, and cultural opportunities in working with younger Saudis, which Vision 2030 recognizes. We feel it is important to have this conversation in Central Florida so we understand the changes and their potential for Saudis and for Americans,” noted PMBF Director David Dumke. The conference will feature Saudi and American speakers, including UCF and PMU faculty, from a variety of academic and business fields. In a series of panels, coupled with special addresses, experts will highlight the design, implementation, and expected results of ongoing reforms, the roles and responsibilities of stakeholders, and opportunities and challenges. The conference is designed to be interactive, and the audience will include students, faculty, and members of the businesses community. Those who submit papers are welcome to participate as panelists at the conference. All accepted papers would be published in the Online Conference Proceedings with dedicated ISBN Number. We would ask those interested to let conference organizers know in advance (see contact information below). Papers must be submitted by Monday, December 10, 2018. Established in 2006, PMU is a private, co-ed university in Al Khobar, Saudi Arabia. As a fast growing technology-driven institution of higher learning, PMU has adopted a highly innovative student-centered approach to education which offer students a chance to develop skills they will need for tomorrow’s workforce. With state of the art facilities, PMU has four colleges including Engineering, Information Technology, Business Administration, and Sciences & Human Studies. For more information, please go to https://www.pmu.edu.sa/. UCF and PMU have a longstanding partnership, embodied by the PMBF Program. Established in 2012, the Program sponsors or co-sponsors public presentations by distinguished scholars and practitioners, student fellowships, and research activities. The Program is house in the UCF College of Sciences. For more information, please go to https://sciences.ucf.edu/pmbfprogram/about/. For more information on the conference or submitting a paper, PMU, or the PMBF Program, please contact Kinda Haddad at kinda.haddad@ucf.edu, or by calling (407) 823-2510. Khaled Al Maeena is a veteran Saudi journalist and analyst and Senior Non-Resident Fellow at the University of Central Florida’s Prince Mohammad Bin Fahd Program for Strategic Research & Studies. Veteran Saudi journalist and foreign policy analyst Khaled Al Maeena, Senior Nonresident Fellow for Prince Mohammad Bin Fahd Program for Strategic Research & Studies, was the featured speaker at an event hosted by the Middle East Institute in Washington, DC on August 15. The PMBF Program and NAAM Association cosponsored the event which focused on Saudi Arabia’s foreign policy and implementation of the 2030 national development. There has been considerable discussion over the past year about Saudi Arabia’s ongoing economic and social reforms, which have been championed by Crown Prince Mohammed Bin Salman. Al Maeena stressed that the changes taking place were absolutely necessary for the Kingdom’s survival. In fact, the Kingdom’s over-reliance on oil, inability to create enough jobs or provide opportunities for the large youth population, and unwillingness to address women’s issues was a growing liability. Thus, the 2030 era of reforms were badly needed and have been very popular with the Saudi public. Al Maeena also discussed Riyad’s foreign policy, including relations with the Gulf, the broader Middle East, and Washington. He answered difficult questions about a number of serious foreign policy challenges, including the ongoing war in Yemen, the blockade of Qatar, the recent diplomatic spat with Canada, as well as Iran, Iraq, and Syria. He noted that Riyadh has had to adopt a new, assertive leadership role in the evolving region to meet a growing number of threats. Ultimately, the Kingdom hopes to work with Washington to foment regional stability and order. The event, “2030 Saudi Arabia: A Conversation with Khaled Al Maeena,” was moderated by Ambassador (retired) Gerald Feierstein, Director of Government Relations, Policy, and Programs and the Middle East Institute (MEI). Guests included Washington-based foreign policy experts, scholars, and members of the press. MEI is a partnering with UCF’s PMBF Program on a project looking at the future of the Middle East through key regional relationships. “It is important that Saudi voices are heard by those working on policy at the highest levels in Washington. Khaled Al Maeena is a respected, independent voice on Saudi Arabian domestic and foreign policy matters. We are pleased to keep working with MEI to promote understanding of the Kingdom,” stated PMBF Director David Dumke. The Washington event was also cosponsored by NAAM Association, a non-government organization devoted to cultural dialog which is headed largely by Saudi civic and business leaders. NAAM often partners with other non-government organizations, including the UCF PMBF Program, to accomplish dialog and social development goals. UCF and its partner, Prince Mohammad Bin Fahd University, will be hosting a conference on Saudi youth, the 2030 plan, and US-Saudi relations in Orlando January 17-18, 2019. For more information on the conference, please go to: https://sciences.ucf.edu/news/ucf-pmu-to-sponsor-conference-on-saudi-arabia/. Issandr El Amrani came to UCF April 3rd to discuss the North Africa Region, specifically in regards to current events surrounding Libya, Tunisia, and Morocco. Issandr El Amrani oversees Crisis Group’s North Africa Project. Prior to joining Crisis Group, he was a writer and consultant on Middle Eastern affairs based in Cairo. His reporting and commentary on the region has appeared in The Economist, London Review of Books, Financial Times, The National, The Guardian, Time and other publications. The fallout from the Arab Spring, Egyptian president Sisi’s second term, and Libya’s impact on the European migrant crisis were some of the topics that were discussed. After the discussion, Issandr had a small discussion with students from the International Relations Club about his career and how to follow in his path. We had the pleasure of hosting a panel discussion on March 8th between Dr. Peter Jacques, Michael Carroll, and Dr. Thomas Crisman on the topic of food and water security in the Middle East and North Africa Region, moderated by PMBF Program Director David Dumke. Dozens of students came out to learn more about the Nexus, which is the term for the various intersections of food, water, and energy security. Some topics discussed were how programs implemented in the region are applied globally in places like Central Asia and the American Southwest and how instability of these resources can lead to interstate conflicts. Congressional Research Service Middle East Specialist Jeremy Sharp visited UCF on April 6th and 7th. Sharp, a former Presidential Management Fellow and current employee of the Congressional Research Service served as a guest lecturer for two courses in the political science department–Politics of the Middle East along with Human Rights Policy. Sharp provided students with an overview of his job responsibilities and discussed the importance of providing non-partisan information to policy makers to better inform their policy decision-making. Sharp also served as a panelist for the International Relations Club’s Middle East in the 21st Century Symposium along with David Dumke of the PMBF program. The panel discussed Middle Eastern policy in the modern age Students asked questions regarding the current political climate in the region, US involvement in Syria, and projections for what the future may entail. Following his panel, Mr. Sharp participated in a luncheon with members of the IRC, fielding questions on policy decision-making and his role in informing Congress on a vast array of issues. Photos of his panel and the ensuing discussion can be found here. On Friday April 14th 2017, The Prince Mohamed Bin Fahd Program for Strategic Research and Studies in coordination with the Office of President John C. Hitt’s had the honor of hosting the Prince Mohammad bin Fahd bin Abdulaziz Al Saud. 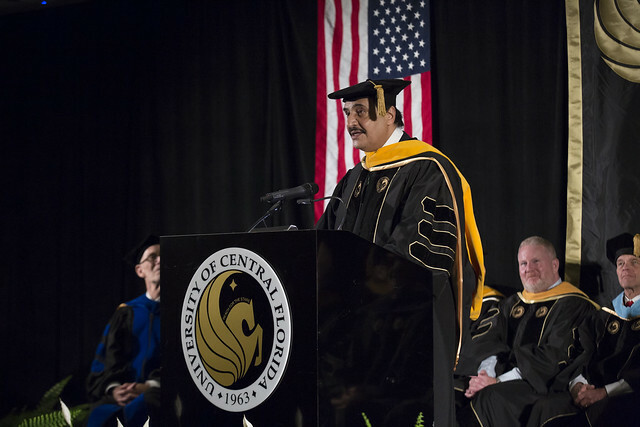 During his visit, Prince Mohammad bin Fahd bin Abdulaziz Al Saud was awarded an Honorary Doctor of Public Service for his contributions and support of UCF. Guests included UCF President John C. Hitt, University officials from the Prince Mohammed bin Fahd University in Saudi Arabia, as well as students from both institutions. After receiving the Honorary Doctor of Public Service, the Prince gave a speech expressing gratitude and goodwill. The audience enjoyed a brief video highlighting the Prince’s achievements in education as well as music performances conducted by students from UCF’s very own music department. Following the ceremony, attendees enjoyed light refreshments and dialogue with other participants. Photos of this ceremony can be found here. On March 27th, 2017, the Prince Mohammad Bin Fahd Program for Strategic Research & Studies, Lou Frey Institute, and the Partnership for Civic Learning, hosted a timely symposium, “Teaching Tolerance & Peace in Education: American Experiences & International Lessons.” The event brought in three prominent and distinguished scholars to discuss the role of education in the promotion of tolerance. The speakers included Dr. James Gibson, Ph.D., of Washington University in St. Louis Department of Political Science; Dr. Patricia Avery, Ph.D., of the University of Minnesota College of Education and Human Development; and Dr. Peter Levine, Ph.D., of Tufts University School of Arts and Sciences. Photos of this event can be found here. On March 1-3, 2017, the Prince Mohammad bin Fahd Program for Strategic Research and Studies hosted guest speaker Mr. Owen Kirby. Kirby formally worked at the State Department as an international political consultant and is still an active member in international relations. He participated in a variety of events at the University of Central Florida (UCF). Owen Kirby has two decades of experience in international relations, specializing in political party development, public opinion polling, and elections. Currently working with clients and partners in the Middle East region, Kirby served in the U.S. Department of State as a Senior Adviser in the Bureau of Near Eastern Affairs (2004-2009), and as a Senior Governance Advisor in Kandahar Province, Afghanistan, 2009-2010. More recently, he has advised leaders in Lebanon and the Palestinian Authority. 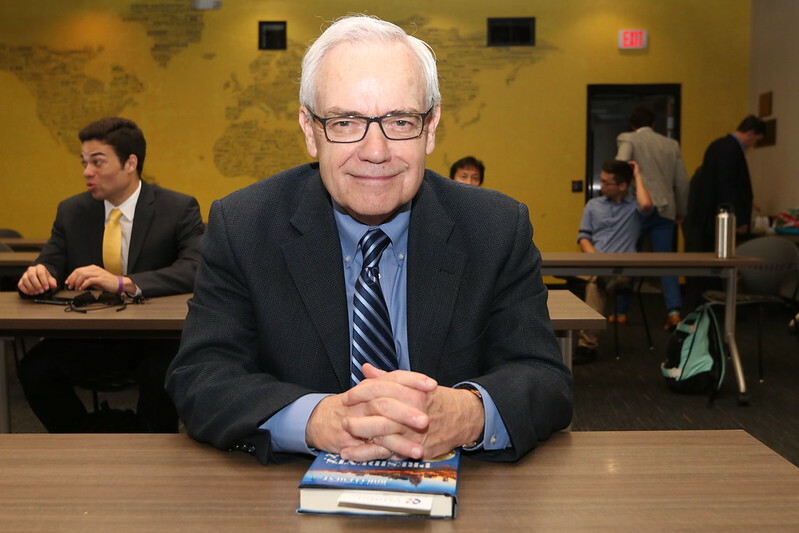 Kirby met with students on a personal level to discuss current events, his extensive experience with the United States government as a state advisor, Middle Eastern affairs, and advised students who want to pursue a career in international relations. Kirby held a discussion-based and question-driven meet with students of the International Relations Club of UCF where he focused on the Middle-Eastern region. Kirby participated in an interview held by UCF students, Yrainy Artigas and Halla Kouatli, where he discussed the issues the Middle East currently faces and “going beyond the headlines”. Photos of his visit can be found here. Former Congressman Bob Clement Visits Orlando Former U.S. Congressman Bob Clement visited Orlando March 6th – 8th. Clement, a longtime friend to UCF and the PMBF program, served in the U.S. House of Representatives for 15 years beginning in the late 1980s. Clement was a guest lecturer in Professor David Dumke’s course on Middle East Politics, met with members of on-campus student organizations during a networking luncheon, and participated in an interview with interns of the PMBF program for the WUCF-TV show “Global Perspectives.” In addition, Clement discussed his newly published autobiography, “Presidents, Kings, and Convicts: My Journey from the Tennessee Governor’s Residence to the Halls of Congress.” His book chronicles his life as the son of a governor to his experiences with policy making as a member of Congress.